I had the world’s greatest assignment for the June issue of Bon Appetit. I can’t tell you all the details because it hasn’t hit newsstands yet, but it involves summer and it involves rules and it involves cooking. I was putting the story together in the middle of February — during one of those stretches of bean-soup-making snow days — so I’m warning you in advance that you may pick up a strong undertone of dreaminess. (Does anything seem more romantic than summer cooking and al fresco dining when you are sitting in your kitchen wearing Uggs?) Anyway, today I want to talk about one particular nugget of dinner wisdom in the story. It went like this: “Always grill twice as much protein as you need. You’ll never regret having leftover chicken or steak when dinner rolls around the next night.” You know I’ve never met an advance-planning strategy I didn’t love, so that stuck with me all the way to the first night of grilling — a rainy April night when we actually had no business grilling, we were just so sick of the cold spring and just really really wanted grilling season to be…NOW. And so we christened the patio with our grilled chicken for people who hate grilled chicken (coming soon: a knock-out variation on it) and, of course, made twice as much. And on Day Two had all the makings of a delicious, healthy two-minute dinner. Abby’s version of the dinner: Most likely the first Mediterranean platter in the history of the world served with Trader Joe’s Soyaki. Place 4 whole wheat pocketless pita rounds on four separate plates. (Or tear pitas into pieces if you don’t think your kid wants the fully assembled sandwich.) Spread a generous layer of hummus (I like original creamy — none of that jalapeno or sundried tomato business) on each plate. 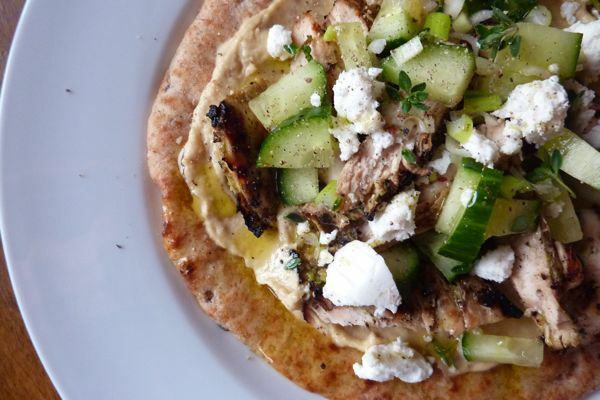 Top with leftover pieces grilled chicken (about 3-4 pieces, sliced should be enough; or some shreds of storebought rotisserie if you didn’t grill last night), crumbled feta, salted cucumber (chopped), a little fresh thyme or oregano, a drizzle of olive oil, and freshly ground pepper. This is so BRILLIANT. Like everything else you write about. I’m making this THIS WEEK! (sidenote. I have something funny for you as a thank you for all your yummy goodness. Go check out http://www.juliasbookbag.com/ today. The rainy weather has officially made me lose my mind and behold the Hello Kitty mania that resulted!) And double sidenote, when I do cooking week, I am going feature you and your lovely book!!! Living in California means we grill — a lot! This chicken recipe has made it on to our table almost weekly since you posted it last year. It is simply the best — and the easiest! We love it. Thanks for sharing. We are all about the Mediterranean dinner these days. Easy and a crowd pleaser. One addition: try the Persian cucumbers from TJ’s. So cute and so yummy. Perfect on pita and dipped in hummus. Also the TJ endamame hummus – delish! Two minutes? Sold! With an infant and a toddler… Umm yes please! Love the reminder that simple and quick can be just as good (or better than) the complicated dinner I build up in my head–and then hardly make because it stresses me out. This looks perfect right now! Yum–this sounds great. And I love the tip! Leftovers are so reassuring–and even more fun when you can make something new from them. Thank you! Just made the grilled chicken yesterday for my daughter’s third birthday party. Not only was I pleased with how good it was, but there were numerous compliments. 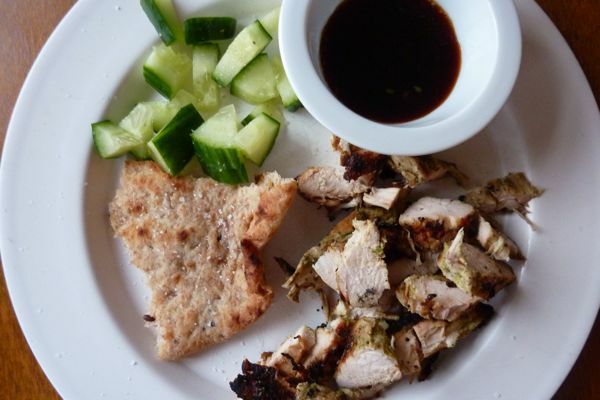 Thanks so much for sharing this recipe – and for everything else on the blog. Always good and always entertaining! Swear to god, leftovers should be dubbed best-evers. We love almost exactly this also, not only because it’s fast and delicious, but customizable to many mouths. this is so simple and looks so delicious! i can’t wait to give this a try!